Past month’s first half went to getting an application for the Netherlands Film Fund ready. 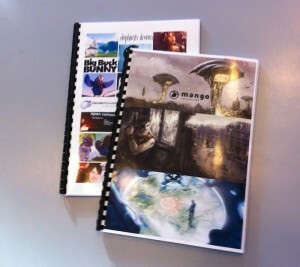 With help from David Revoy (artwork for Mango script presentation) Anja (budget spreadsheets) and Rob (Sintel + Institute report) I delivered two booklets with about 150 pages of content to the Fund 2 weeks ago. (see image). Film Fund budget would be *very* welcome to lift up the quality of our filming work. Fingers crossed! In the past weeks I’ve also done paperwork for contracting, been contacting potential sponsors and studios, booked flights for everyone to Amsterdam, visited apartments where they can live, checked on where to get good bicycles. Also had a meeting with DP Joris Kerbosch, I’ve already booked in several experienced VFX supervisors as consultants, contacted camera sponsors (want Red epic! ), visited greenscreen studio, checked on locations for filming (incl old factories). The actual filming is still depending on a lot of variables. Current estimate is to rather do it a bit later than too early. Instead of ‘2nd half april’ it more is ‘mid may’ now. Final decisions on this will be done with Ian & Joris here, in about 3 weeks. Hey Ton, what about Michael Williamson? Is he still on the project? Michael just completed a huge job for a client, needs some relax time. For time being he’ll be involved as volunteer. David was available for 2 weeks work here fortunately! It isn’t the animation, but VFX film? What about the so called coding sprint? The idea to fly in 4-6 devs to Amsterdam to work on the depsgraph has been cancelled. It would be too expensive (flights, hotels) but also because no short term results were being expected. Instead, development fund money goes to smaller development projects now. Shooting with a red epic/scarlet would be interesting, because you would have the possibility to capture HDR footage. And composition of HDR live footage with CG is relatively new and gives nice possibilities. A pipeline with some related tools for this would surely get some attention. As you’re gonna shoot the film in a proprietary format (REDCODE RAW), you’ll need to use some proprietary software (although it’s freeware) on a Mac or Windows PC for converting these files for offline editing and to OpenEXR for the VFX workflow. I’m aware that we might need proprietary software to convert the Red footage to OpenEXR, however from then on the pipeline will be entirely free/open source and Blender. Grading is one of the targets to do in Blender! It would seem that you’ve been very, very busy as of late Ton! It’s usually quite easy to overlook a lot of the finer, yet most crucial tasks when producing something as complex as a short film. Reading over the update fills me with excitement though as there seems to be some excellent progress being made in order to give Mango the best start possible. It’s very interesting to hear about the visual effects consultants, I hope they can add a lot to the development of Blenders visual effects pipeline, and to Mango overall. A Red Epic would be really great. The Guys from Filmriot had one for a couple of days (They made a Short during that time) to test it against there DSLR Camera (A Canon 5D). The Colors of the Red Epic were great after the color grading and you could even record slow-mos up to 300fps. The model they had was I think the Red Epic 5.0 allowing to record Videos up to 5k resolution. I think the only negative thing about it was that it also suffers of strobing like other DLSR Cameras but not as bad. Blender already got REDCODE codec support since 2.49 (i think) but it’s not compiled by default and is also deactivated in the official BF Build. I don’t know how well the codec is supported in blender but it should be possible to edit and color grade Red Epic footage in Blender. Stereo is still an option, but only if a sponsor fully covers the additional work it brings for us. Ton, don’t be so modest! News about your tenacious work behind the scenes is very exciting! I’m baffled that you produced 150 pages to apply for funding. In my field of work, one usually produces only about 10-15 pages for a proposal, which already takes me two to four weeks to write and fine tune. Also, I just noticed that the pre sale counter went over 1k. Congratulations! Crowd funding strikes again! Can someone explain why redcode is so great. From what I read on wikipedia, it compresses the sensor data with at least a factor 8 before demosaicing the data. I would say that compression artifacts would make subsequent demosaicing much harder. one thing that makes red file so great is the meta data. Stuff such as iso and white balance are meta data that you can adjust in post! Its amazing. They also have a large dynamic range.